Netflix’s gripping and intimate original docuseries, Medal of Honor, celebrates eight recipients of the military’s highest award for valor — bestowed upon fewer than 3,600 Americans since President Abraham Lincoln signed it into law in 1861. With archival footage and commentary from historians and military leaders, the series highlights the lives and experiences of these courageous men who went above and beyond the call of duty. Their battlegrounds were Italy, Germany, and France during World War II; along the 38th parallel in the Korean War; in Laos during the deadliest year of the Vietnam War; and in the rugged mountains of Afghanistan. Family members and brothers-in-arms also recall the extraordinary odds faced by the servicemen, and through intense recreations, viewers get inside their minds to uncover how they handled what many have described as “the worst day of their lives.” The diverse group of featured recipients — including three living veterans — came from a Massachusetts farm, a New Mexico immigrant community, small towns and big cities all across the nation. 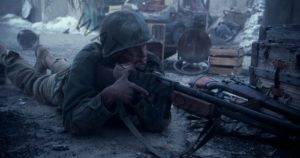 Watch Medal Of Honor’s Trailer here. When is Medal Of Honor out on Netflix.com? If you like what read about Medal Of Honor, please remember to share Netflix New Releases on Facebook, Twitter or wherever you guys want it’s all appreciated.